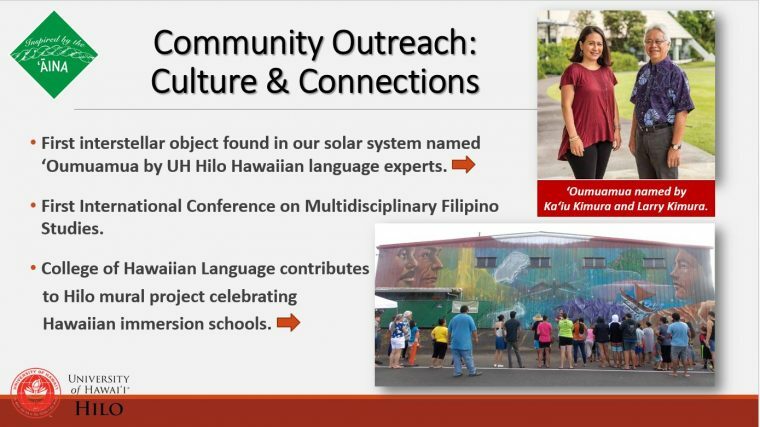 With today’s technology, the guidance of expert mentors, and a deep desire to make new discoveries, UH Hilo students are learning from many sources and contributing to their selected fields, their communities, and the world. The Mission Statement of the University of Hawai‘i at Hilo begins with the adage, ‘A‘ohe pau ka ‘ike i ka hālau ho‘okahi (One learns from many sources). 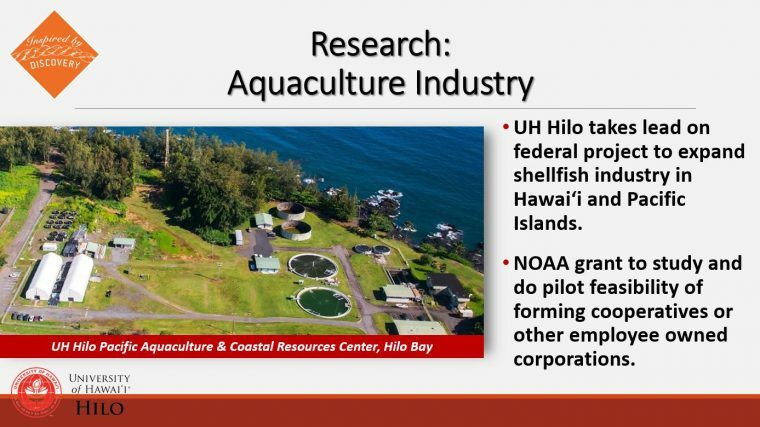 One unique aspect of UH Hilo is that we offer both undergraduate and graduate students many opportunities to do research in a variety of fields. 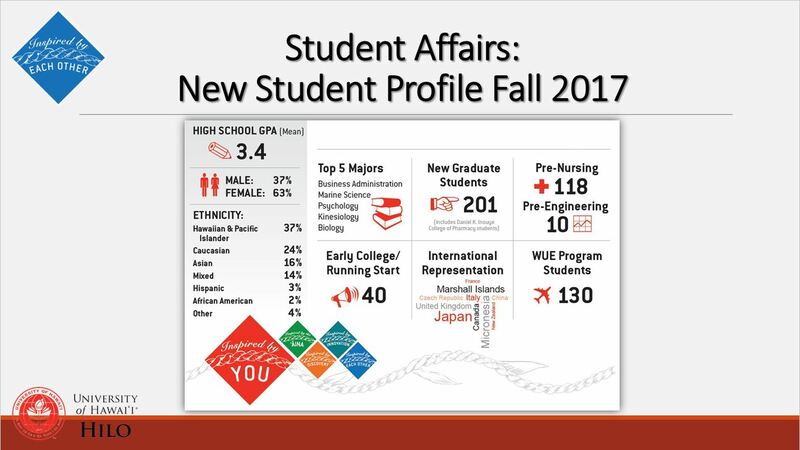 Our students are doing important work, collecting and analyzing new data, publishing findings alongside their mentors, graduating with a packed résumé and a degree, fully prepared to join the workforce or continue to a terminal degree. I would like to share with you some research projects where our students are learning by doing the work, making the discoveries, and enriching the world with new knowledge. UH Hilo professors, scientists and students provided valuable expertise and resources on multiple fronts during the recent lava flow in Puna, helping government officials assess hazards to the public. 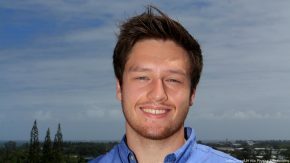 A team of undergraduate and graduate students led by Associate Professor of Geography Ryan Perroy piloted drones day and night capturing imagery of the lava flows, critical information for the government agencies overseeing eruption response. UH Hilo volcanologist Cheryl Gansecki, assisted by undergraduate students, provided real-time chemistry analysis of lava samples. The information helped government scientists determine how the lava would behave and how fast it moved, critical information for response plans. 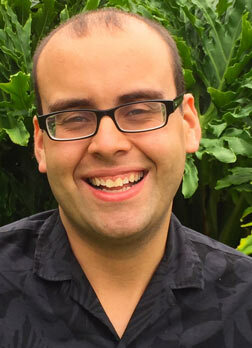 While completing a summer internship at the University of Michigan, UH Hilo astronomy student Kyle Steckler developed an algorithm to discover minor planets that orbit the sun beyond Neptune. The algorithm did not fully work all summer and he was not discovering anything new. But about three hours before he gave his final presentation at the symposium in Ann Arbor, he was running his software and it suddenly popped up something new—Kyle had discovered a new object in our solar system! Kyle’s internship was funded through the Research Experiences for Undergraduates (REU) program, a highly competitive program funded by the National Science Foundation that supports active research done by undergraduates. He will graduate with this amazing accomplishment already on his résumé, a solid foundation for making future discoveries. Another astronomy student, Chantelle Kiessner, is doing solar investigations, having been awarded three internships over the course of the past two years. 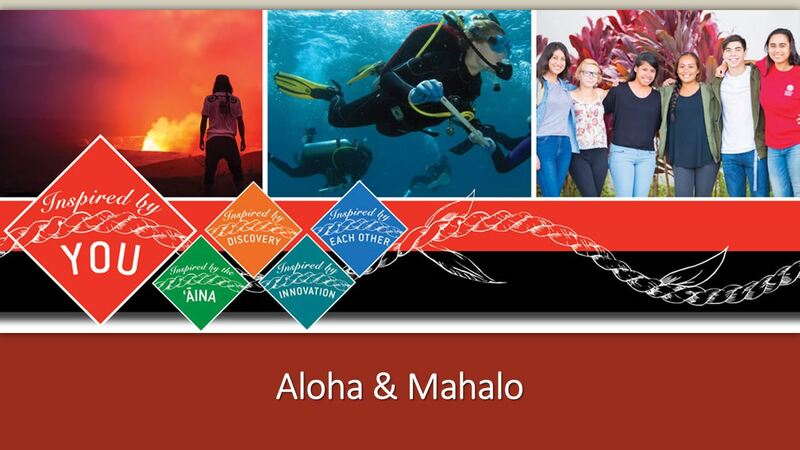 She started in 2016 as a Hawai‘i Space Grant Consortium trainee and then, building on the skills learned as a trainee, she was selected for the Akamai Internship Program in the summer of 2017. 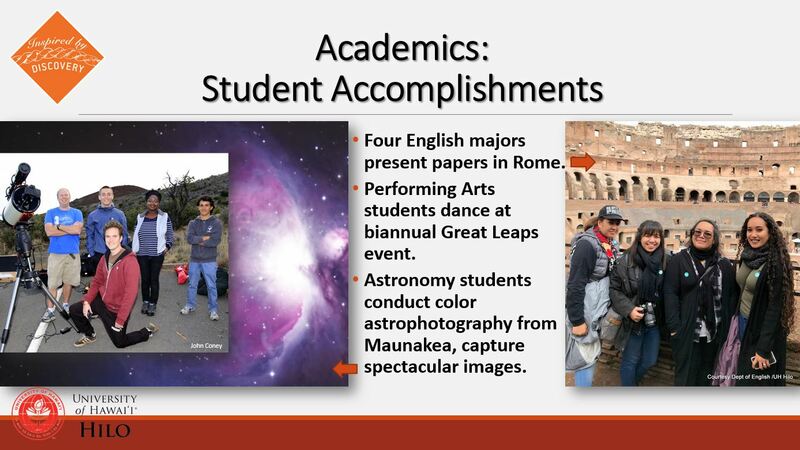 As an Akamai Scholar she was placed at the Daniel K. Inouye Solar Telescope on Maui to work on quantifying data on the new Adaptive Optics system where she looked for ways to correct the errors introduced by Earth’s atmosphere. 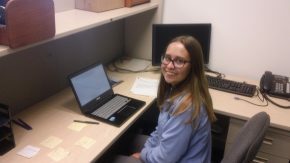 Chantelle then conducted research over the past summer as an intern in the REU program. She studied at the Laboratory for Atmospheric and Space Physics, a research facility at the University of Colorado, Boulder. While there, she worked at the National Solar Observatory analyzing spectral data from the solar chromosphere, the reddish outer layer of the sun. These two students are already earning their research chops as undergraduates and I can only imagine the great work they will do in their future careers. Sabena Siddiqui, a graduate student in tropical conservation biology and environmental science, is researching the sounds of humpback whales when they are not singing, an aspect of their communication that is clearly important but little studied. 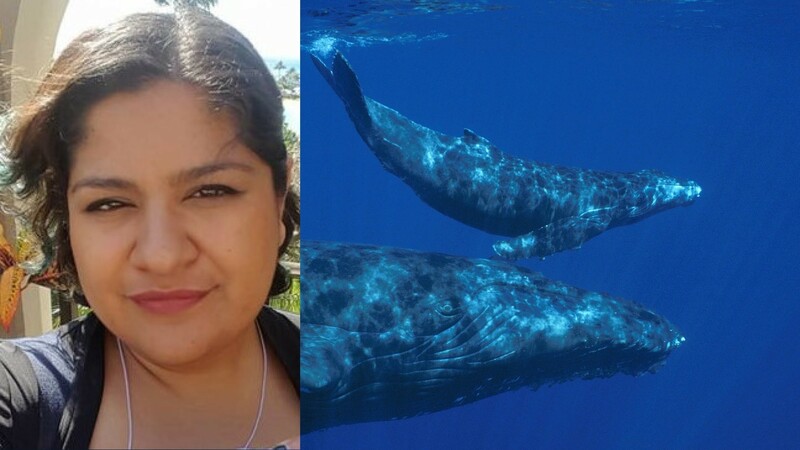 Sabena’s investigations focus on spectral analysis of the social sounds of the humpback whale population that breeds in Hawaiʻi. 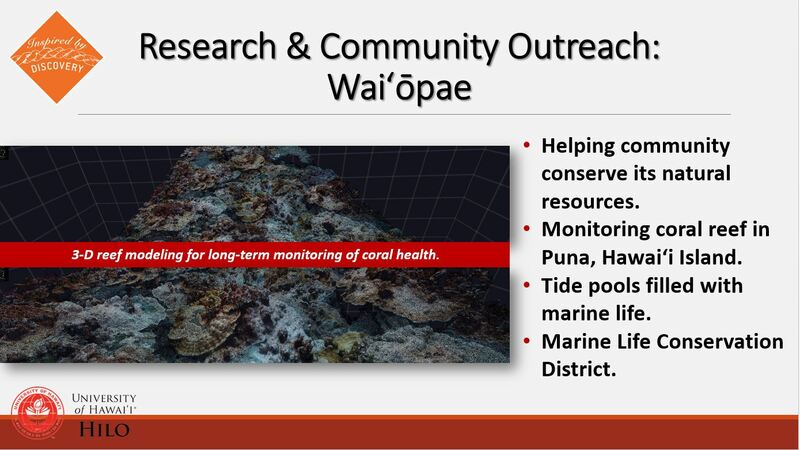 Sabena secured funding to attend UH Hilo through the NSF Centers for Research Excellence in Science and Technology (CREST) with partial funding through the Listening Observatory for Hawaiian Ecosystems bioacoustics lab at UH Hilo. In addition to her graduate studies, for the past seven years Sabena has served as the student chair of the American Cetacean Society, the world’s oldest whale conservation organization. Her role is to be a mentor and guide to student leaders of other groups on campus. 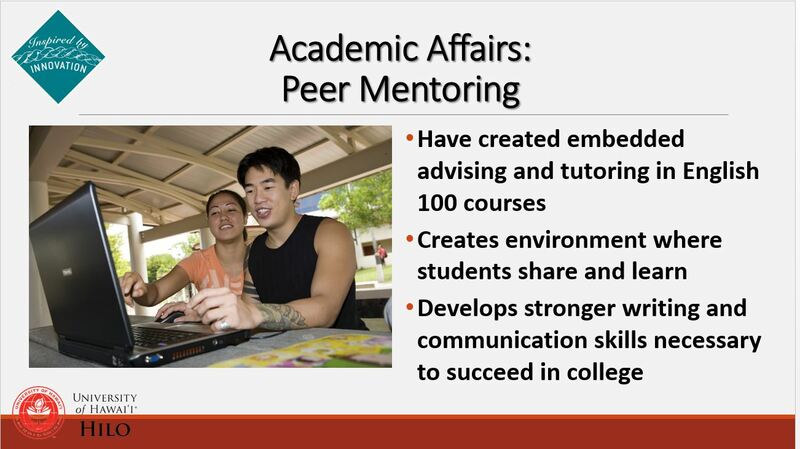 Armed with today’s technology, the guidance of expert mentors, and a deep desire to make new discoveries, these students are learning from many sources and already contributing to their selected fields, their communities, and the world. 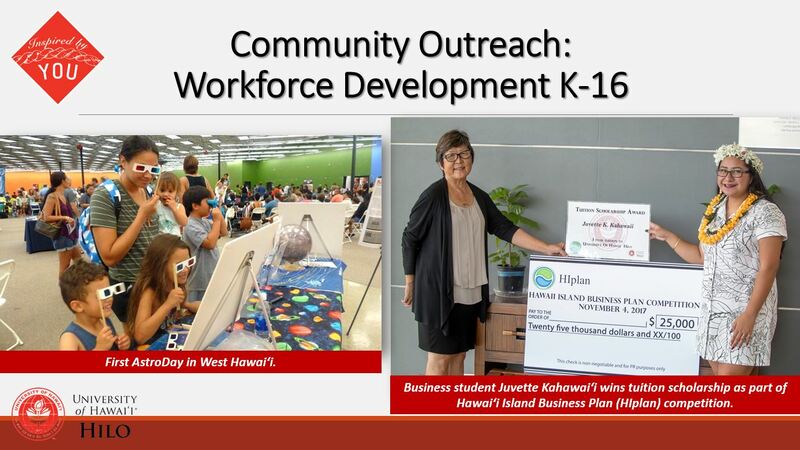 In a future column I will share with you the work of several programs that support our students in exploring and investigating our island and beyond. 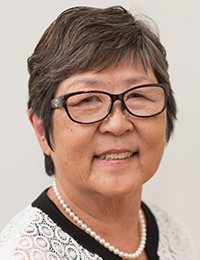 Interim Chancellor Marcia Sakai hosted a Coffee Hour with the local press today on the campus of the University of Hawai‘i at Hilo. 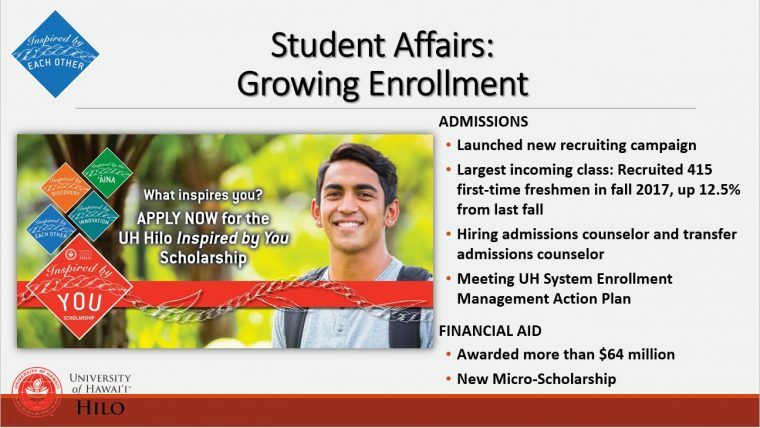 Interim Chancellor Sakai shared the following information in her PowerPoint. 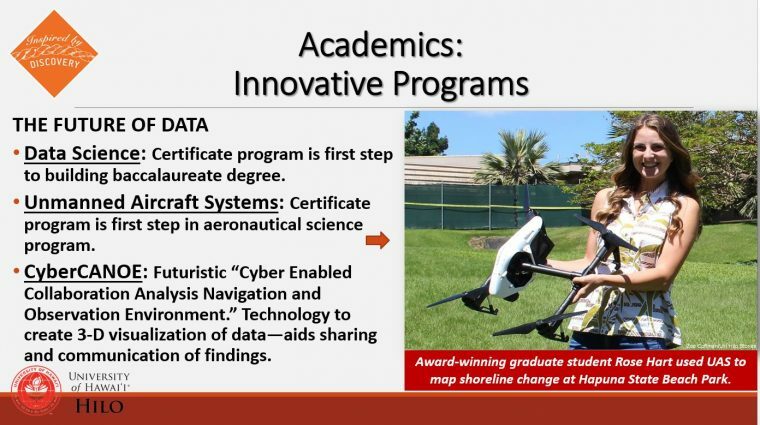 UH HILO DRONE TEAM. 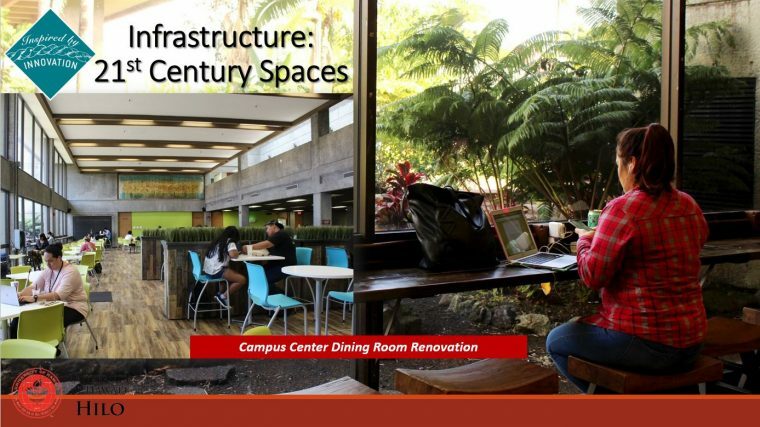 UH Hilo had a vital role in response to the recent historic lava eruption on Hawaiʻi Island. 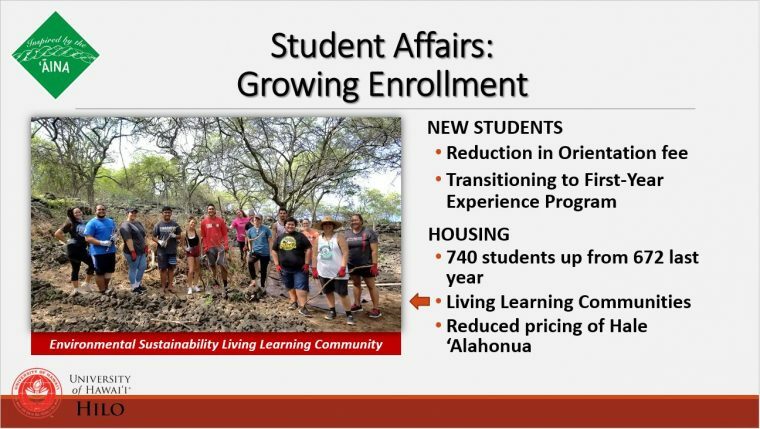 In the photo above, students and staff, four holding drones used in aerial surveys, in the field at recent lava flow in Puna. 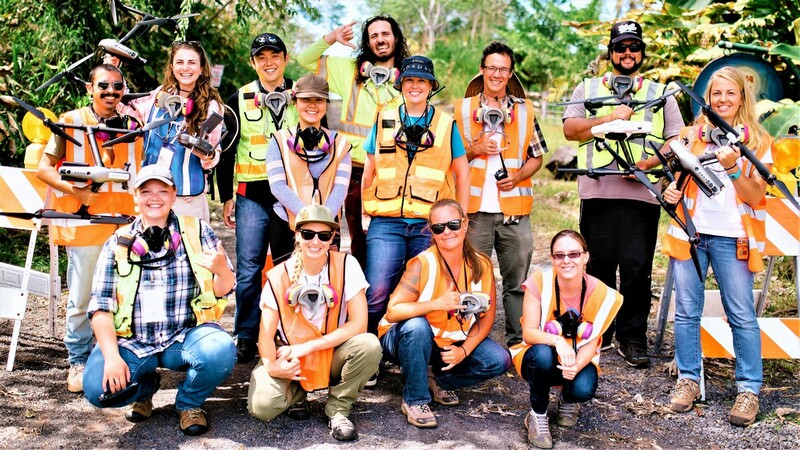 The team piloted drones day and night to capture thermo data and imagery of lava flows, information critical to government agencies overseeing eruption response. 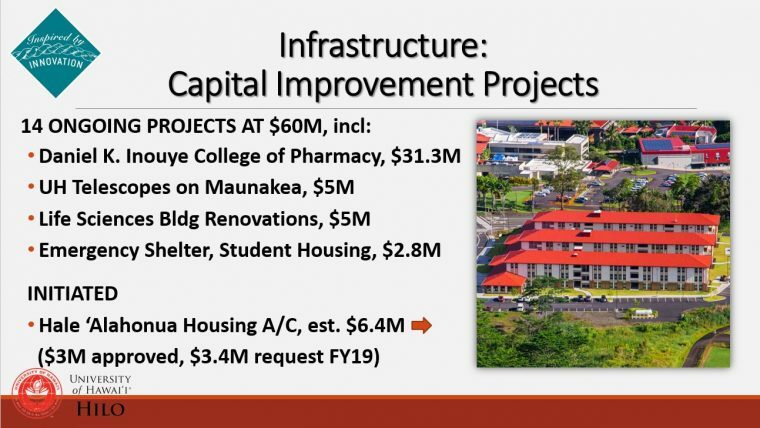 They also analyzed threat to Puna Geothermal. Other teams of scientists analyzed chemistry of lava samples at labs on campus. Courtesy photo, click to enlarge. 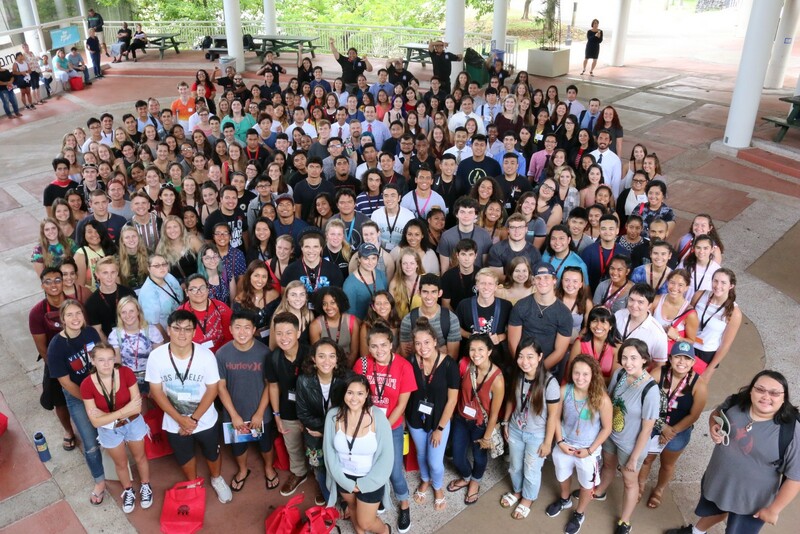 Freshman class during Orientation in August 2018. Courtesy photo, click to enlarge. 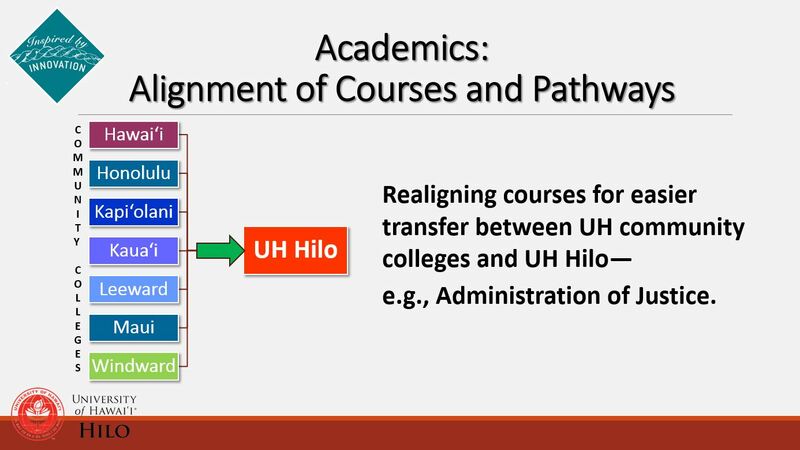 UH Hilo was recently ranked the Most Diverse 4-Year University in the Nation by the Chronicle of Higher Education Almanac 2018. Interim Chancellor Marcia Sakai gave a presentation today to the Rotary Club of Hilo Bay about directions and strategies underway at the University of Hawai‘i at Hilo. 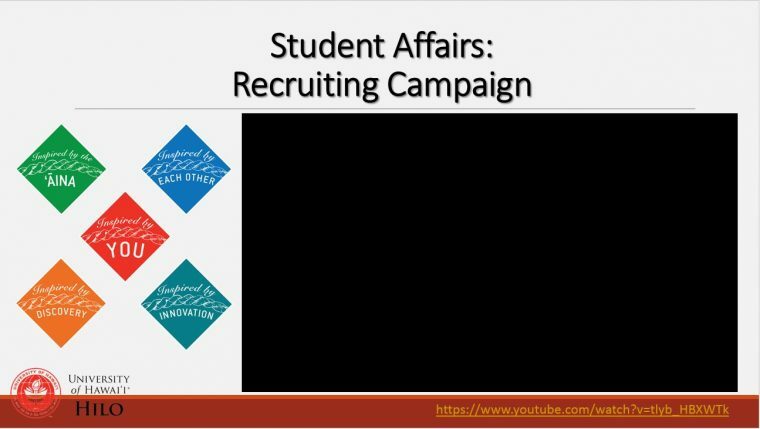 View all PowerPoint slides below or in PDF. Click photos to enlarge. The program is part of a statewide project funded by the National Science Foundation, which awarded the UH System $20 million last year to do a five-year study of water sustainability issues throughout the state. 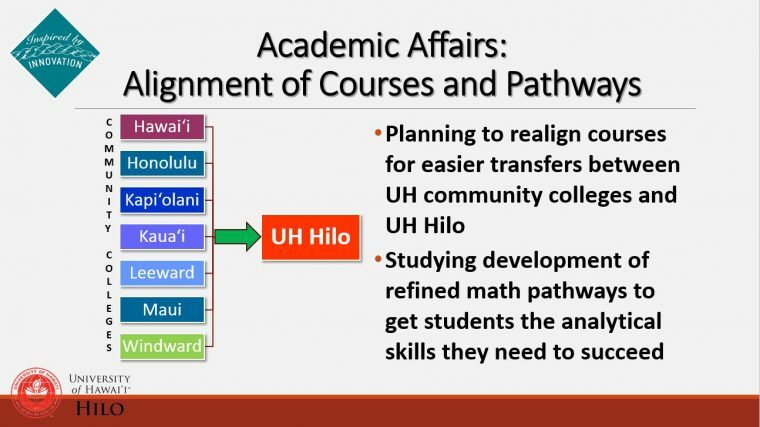 I am pleased to share an update on the exciting new data science degree program at the University of Hawai‘i at Hilo. The program is multidisciplinary in scope with elements of geophysics, microbiology, cyberinfrastructure, data modeling, indigenous knowledge, and economic forecasting. Students will learn how big data sets, from seemingly unrelated areas, can be used to solve complex problems. Data science is a field that can have great impact on our local communities and environment. 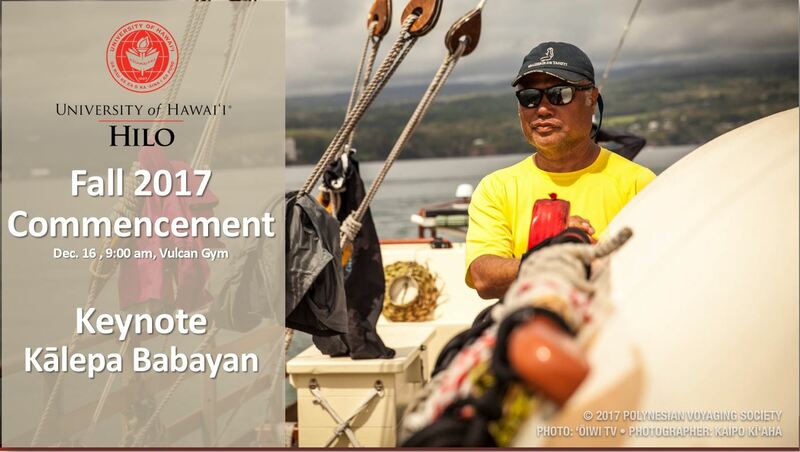 The collection and analysis of big data in areas such as water resources, for example, can reveal patterns and trends that can alert decision makers such as lawmakers and policymakers about the directions needed to ensure future stability for our island and state. This is especially important in relation to human behavior—for example, analyzing statewide water resources can reveal things our communities can do better to use and conserve water more efficiently. 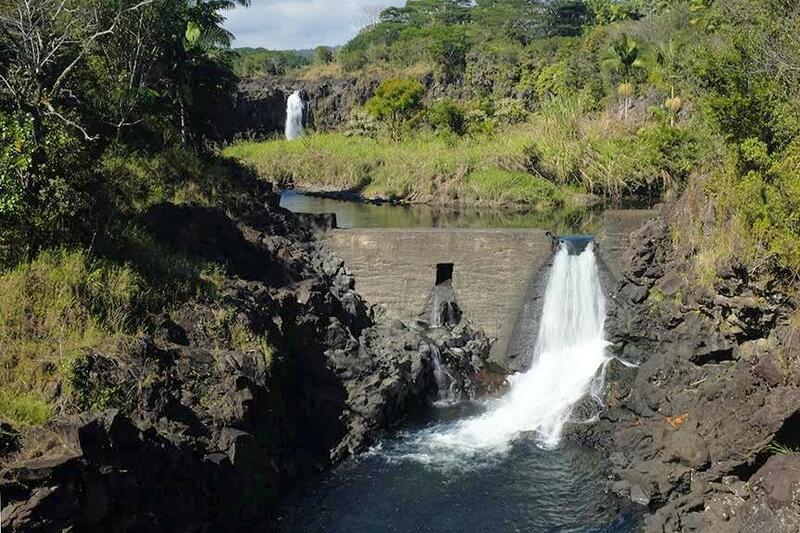 The UH Hilo data science program is part of a statewide project funded by the National Science Foundation, which awarded the UH System $20 million last year to do a five-year study of water sustainability issues throughout the state. The project is called ʻIke Wai (Knowledge, Water) and has the overall goal of gathering new data on groundwater flow, sustainable yield, and economic impact. The data will help communities and state decision makers preserve Hawaiʻi’s water resources for the future. 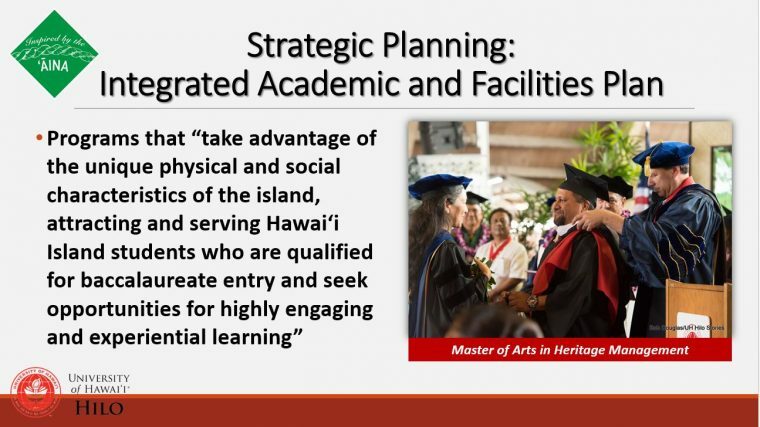 Four tenure-track professors will lead the UH Hilo program. 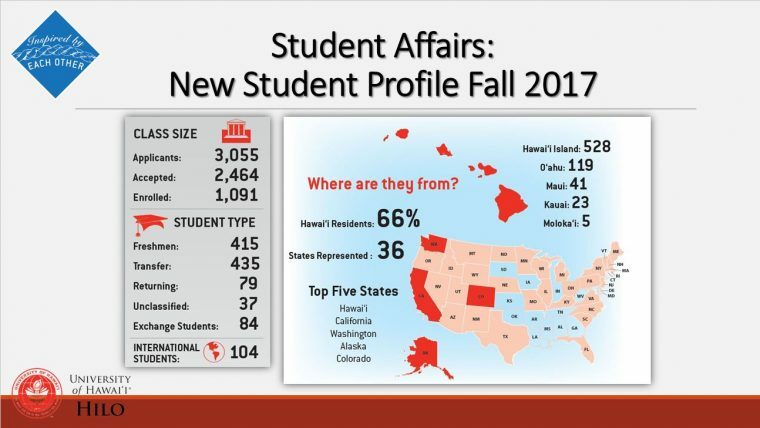 The first two were hired over the summer: Travis Mandel, assistant professor of computer science and Grady Weyenberg (who grew up in Hilo), assistant professor of mathematics and statistician. They will be joined in the near future by the others in the natural and social sciences. 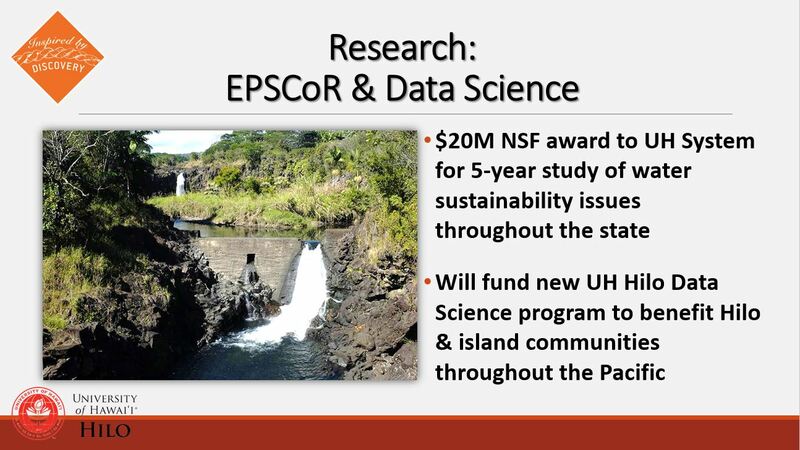 While developing the UH Hilo data science program, our faculty team will work with ‘Ike Wai data scientists and water researchers around the state, collaborating alongside local communities, indigenous peoples, government agencies and businesses to generate the scientific data. 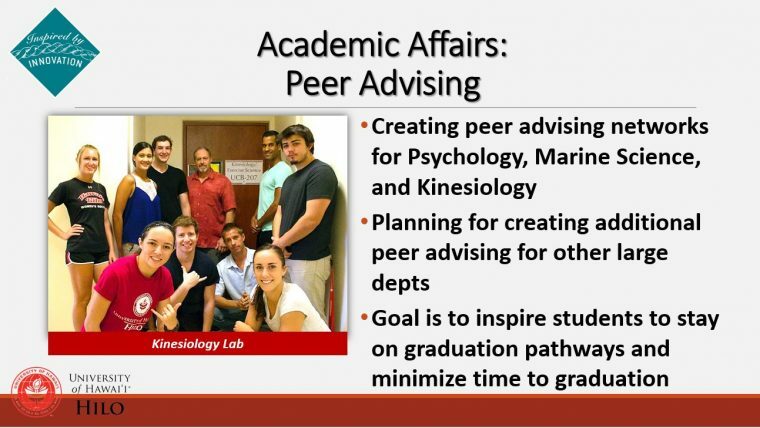 Partners also include undergraduate students, graduate students, postdocs and junior faculty to address water challenges at the academic and policy level. As part of our program, a cohort of ‘Ike Wai student scholars will be chosen each year to do research and analyze the data collected (this year’s scholars are currently being chosen). The scholars will work with six faculty across natural science fields on research projects including investigation of local flora and fauna, genetics, and improving educational software. 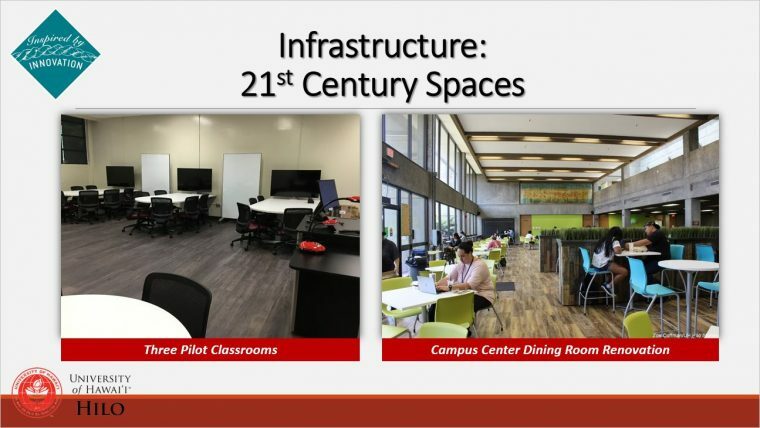 This is an invaluable training ground for our students, and when they graduate, they will have the background and skills needed to start professional careers in related fields. 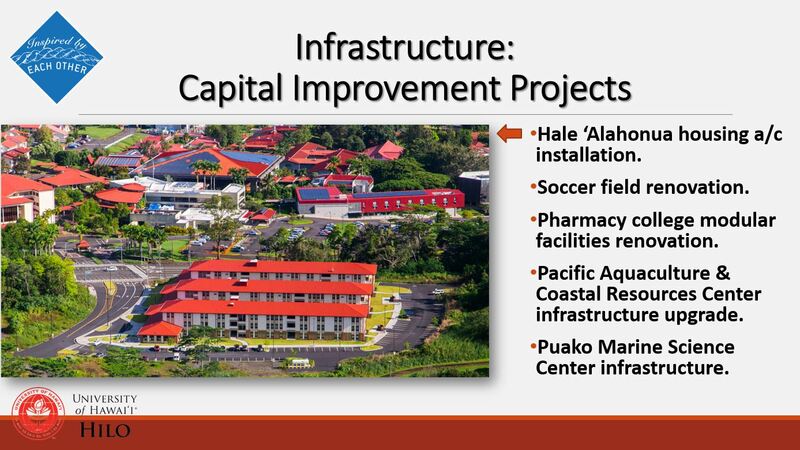 This is of immense benefit to our local communities and state. Since Travis and Grady’s arrival, they have been hard at work on the process of getting approval for a certificate program in data science, which will be followed by a baccalaureate degree. 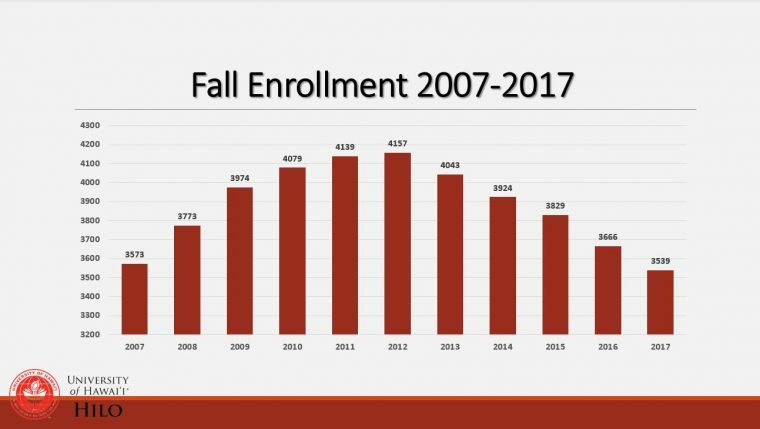 Meanwhile, proposals have been submitted to launch four new courses: three in computer science and one in math, which will form the core curriculum. 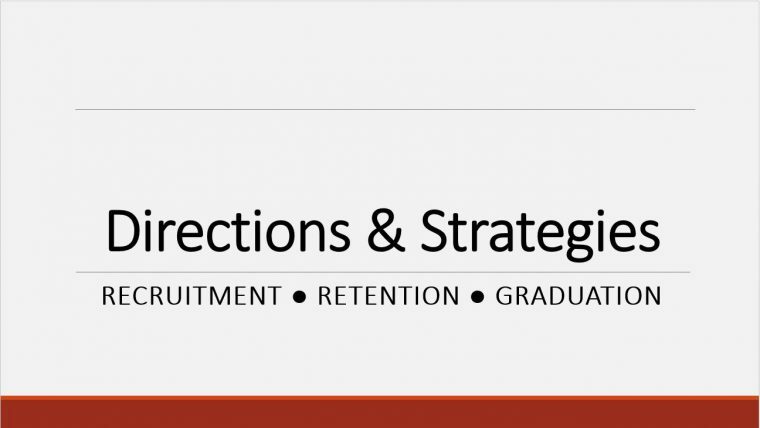 Two of these courses will focus on computer programming and language, statistical techniques, and data plotting. Grady is primarily involved in the development of the math course with focus on computing language and statistics, which will be attractive not only to students who are earning a data science certificate, but also to anyone in a natural science program (or even beyond) who needs an introduction to applied data analysis techniques. Target date to launch the new course is fall of 2018. 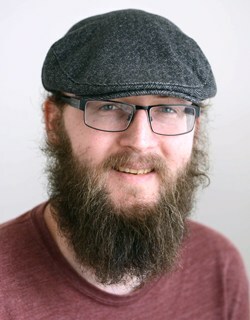 Travis is the new data science hire in computer science. 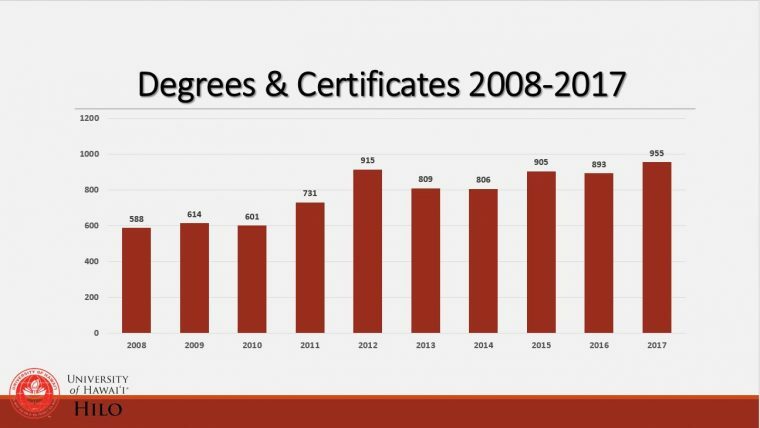 He is also working on the design of the certificate and its courses, proposing a new course on cutting-edge machine learning techniques that will take students to the “next level” of data analysis. His research interests lie in the realm of artificial intelligence and machine learning. Specifically, he is interested in how we can use data to automatically improve human-focused systems. 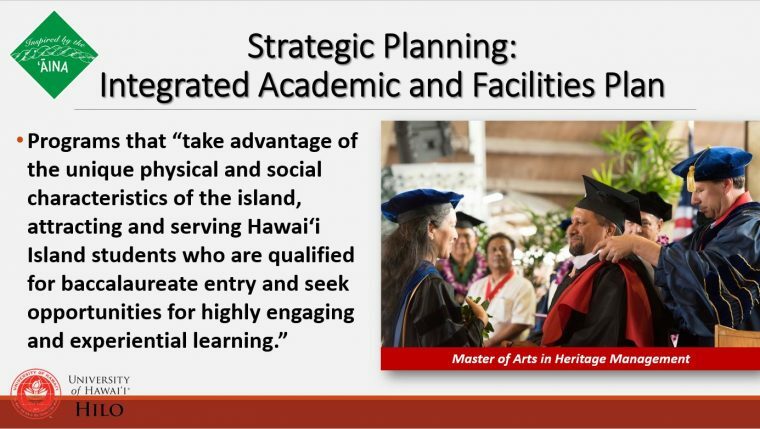 While the university is developing curriculum, we also need to ensure that students are getting a good background in specialized techniques that will be useful for local industries, such as renewable energy and agriculture. It will be this practical application that will make the biggest impact on our local communities and economy. Faculty have recently begun reaching out to local schools and businesses, with the intent to ensure that a smooth transition can be created from secondary education to the university and through the data science program to the workplace. It will be wonderful to see high school students exposed to some of the interesting problems that can be addressed with data science before they get to the college level. The development of the data science initiative makes us very proud of our campus—we are educating our students to be the problem solvers of our state’s future while helping to protect and conserve the islands’ precious natural resources. See also: UH Hilo developing new data science program (UH Hilo Stories, Oct. 31, 2017). 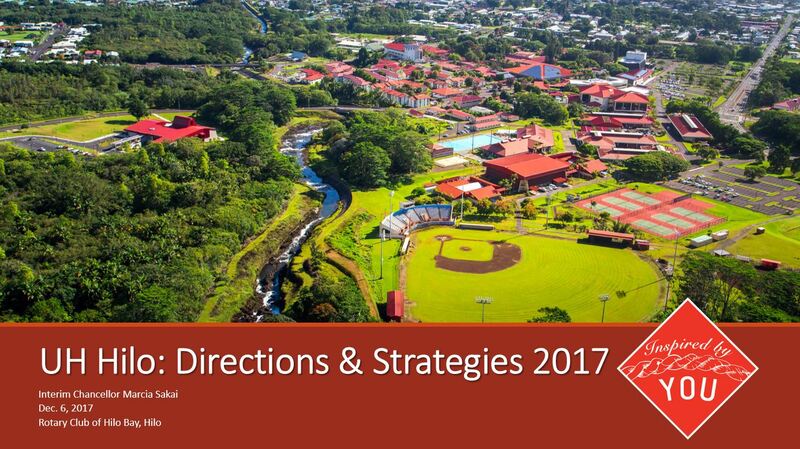 A presentation was given to the Senate and House Higher Education Committee yesterday, Oct. 11, 2017, on campus, about directions and strategies underway at the University of Hawai‘i at Hilo. 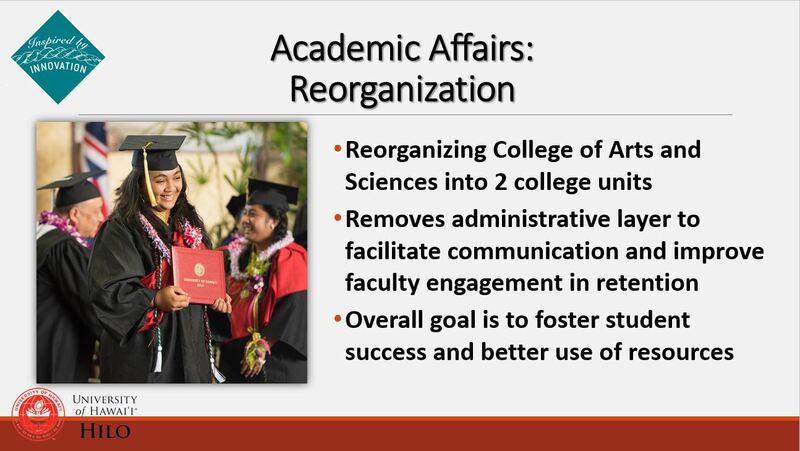 Interim Chancellor Marcia Sakai was unable to attend; the event was hosted by Vice Chancellor for Student Affairs Farrah-Marie Gomes. Marcia Sakai or Farrah-Marie Gomes.